Kenny Mould was in incredible form between the sticks and everyone put in great effort but there were still quite a few simple errors and a lack of goals. Next week is Inverness at the Bught Park before a week off then Strathspey at Freuchie Park. 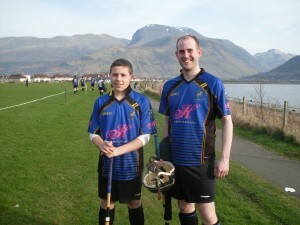 The two shots are courtesy of Diablo, one of the team with Ben Nevis as a backdrop and the other is of Eoghan and Connor, Connor making his debut with 15 minutes left to play on the same team as his cousin for the first time. Remember Hugh Dan’s Da Mhaide Dhireach this Tuesday at 7.30 at An Lanntair. Meallaibh bhur nàidheachd! 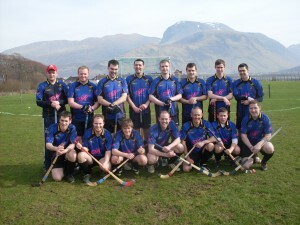 Bidh Andy, Paul, Donald, Innes, Conor agus Micheal a’ riochdachadh na h-Alba aig Iomain Cholmcille a Còig air 7mh den Ghiblean. Bidh Eòghan na mhanaidsear a-rithist agus Sean a’ cluich cuideachd. 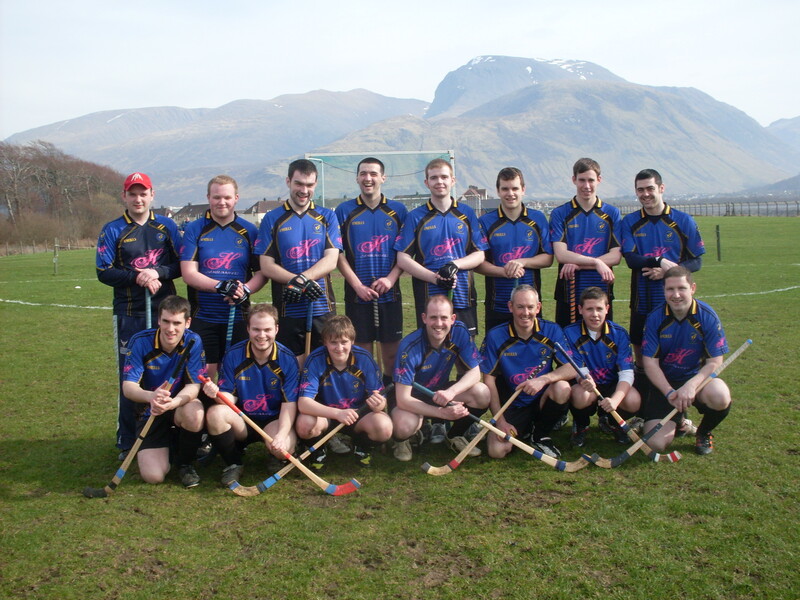 Congratulations to Dukey, Andy, Donald, Innes, Micheal and Conor who will be playing for Alba at Iomain Cholmcille on the 7th of April in Portree. Eòghan is manager again and Sean has also been selected. Seo an sguad làn – Here is the full squad. Point won or point lost? It’s probably a good thing. A year ago we were delighted to get a point at Cannich, this year we were gutted not to come away with a win after a performance where we controlled possession and territory but just couldn’t find the target. Tyson had a penalty saved, but in all fairness scoring penalties is a tough job and we shouldn’t have needed it. The youngsters all put in a good shift and it was a nice sunny day. Thanks to Strathglass for the hospitality at the Slaters Arms. Will took a bad blow to the arm, let’s hope he gets better soon as well. If it’s action shots of Ally that you want check out Neil G Paterson’s shots from the first half. Let’s start putting these games away! 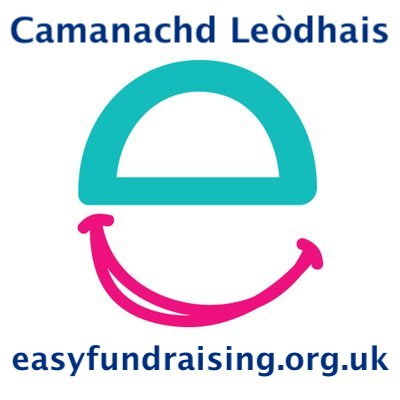 If you are in the Inverness Area – Thigibh is thoiribh taic dha na Gillean! In other Lewis Shinty news, the Sean MacLeod played for the Tayforth on Saturday at Musselburgh against Ardnamurchan – a 2-1 win for Banterchello’s outfit, 60 minutes at wingback and the rest at wing centre. Well done Sean. Epic. Banter. A close game at Castle Leod in our second Ross-shire derby in succession but we just fell short against a top team. Despite having the lion’s share of the match up until that point, we fell behind to a Colin MacLellan goal around quarter of an hour in. We rallied well but the youngster grabbed a second just before half time but then Will stepped up to the mark and cut the deficit as we went in at half time 2-1. We started the second half okay but we didn’t clear the lines and this allowed Kirk Taylor to notch a third for Cabers on 50 minutes. Yet again we rallied and Stompy scored a peach of a backhand past Donald Mellis to make it 3-2. It was a rip-roaring finish to the game but we but couldn’t find the equaliser. Uncompromising on the park, the Cabers boys were fulsome in their praise afterwards, noting our vast improvement since last year. Thanks to Fiona Hawthorne for probably the best gift for the bus ride home. Michael MacLeod was a revelation in midfield, his shying absolutely phenomenal and not one player let the side down. Thanks also to the young substitutes who came along, Paddy had a good shift replacing Ally early on before being switched and Daniel who managed to get a few minutes at the end. Always a tough ob for the manager to make changes when a game is so tight but everyone will be needed this season and chances will come. Next week Strathglass at Cannich. Dukey will have informed everyone of whether they are playing. An entertaining start to the season before we eventuallysuccumbed 4-2 to our mainland neighbours. James Rolfe opened the scoring for Broom with ourselves giving him a generous three deflections to outfox Conor. However Will grabbed the equaliser right on the stroke of half time. Unfortunately the wind switched completely in the second half which meant we received no advantage at all but we played gamely in the second half and Jamie MacFadyen, who scored the seocnd and forced Dougie into a mistake to score an own goal for the third was the difference for Broom. Eoghan scored our second to close the gap with around ten minutes left but Ruairidh Hughes grabbed a last minute one to make it 4-2. Conor pulled off some excellent saves and Gaga was solid at the back, also good to see Dougie and Duncan in top form. Especially good to have Duncan back in Blue and Black. John Hughes said after the game “So that counts as the cup match as well?”, a sign that Broom were happy to get out of Inverlael with all the points, as well as being a tribute to how far we have come in a year. Great to see the Broom folk as usual and we wish them luck for the rest of the season. Stompy had to spend a few hours at Raigmore getting stitches, photos are on Facebook if you want. Full report will be in Gazette as always. Team: Conor, Gaga, Duncan, Innes L, Dougie, Scott, Eoghan, Paul, Donald L, Ally MacKenzie, Will, Stompy. Subs, Micheal, Andy, Al Reed, Michael, Paddy.